We live in a senior citizen mobile home park on the outskirts of the small city of Hudson, New York. We are just off Rte 66, a busy highway, but the park is surrounded by woods and open fields, yet close to everything - hospital, stores, Amtrak - all within a 5 to 15 minute drive. 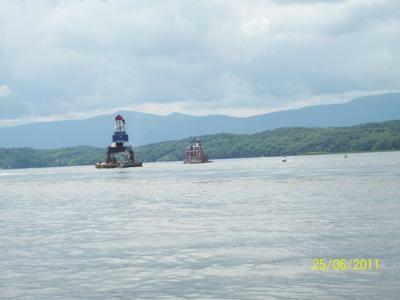 Spring, summer and fall you will find us at the Henry Hudson Waterfront Park, enjoying the river, the Hudson/Athens Lighthouse, and the Catskill Mountains in the distance. We love flowers and always have a flower garden to putter in. I write poetry, and stories about my childhood. Most of all we enjoy being with our children, grandkids, and our little great grandson. The world is beautiful and we enjoy living everyday to the fullest. I hav recently been diagnosed with TMJ. This happened to me because of intubation when I had my gall bladder surgery. Your words say it all! Wouldn't it be nice if everyone could find the contentment you folks have found. Kudos to you for recognizing where you are at this moment in your life and how content you are with it. Our weather has been frightfully hot and humid. Been 98 with a hot, hot breeze - yikes! We stay pretty much inside in this kind of weather, and make sure to get our errands done in the early morning. We are early risers - always up no later than 4:00 a.m., sometimes earlier. Such a wonderful tme of day. We like to take our coffee out on the deck, and sit and listen to the early morning quiet and the stars twinkling in the sky. It is the best time of the day and gives us a chance to sit quietly and count our many many blessings. I lost a good friend this week. A wonderful person, my walking buddy, a kind and generous soul. I am going to miss her and I wish her God speed. I have learned to enjoy the simplest things in life, as they are the best. The most important to me is my family, and my friends. When my family is happy and healthy, I do not need anything else. What a blessing to wake up in the morning, to hear the birds sing and see the sunrise. The freedom to come and go as we please, the choice of doing something or nothing!. It just does not get any better than this. So everyone - enjoy your days, count your blessings, and thank God for all of the days He gives us. Family, friends, health and the little corner of the world that God has chosen for us - how thankful we are. I can relate to the idea of being where you can see the sky, the sea (or river) every morning It makes the day seem brighter and life worth living. I am close to the sea and live in a place we call Gods Country (He has a lot Of country) to choose from. You seem to have found that which is merely in front of our eyes to see. Friends and family with pleasant surroundings. If we have that to wake up to each morning - what more do we need. Glad to hear that you are enjoying your retirement. As long as I wake up on the right side of the grass every morning - I know it will be a good day!